Stalin's triumph is a platoon level game, and it is part of Lock 'N Load Publishing's 'Nations At War' series. 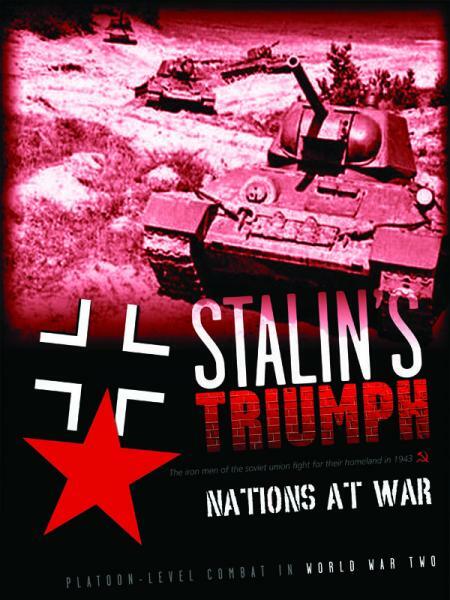 Stalin's Triumph is about the battle of Kursk on the Eastern Front in July 1943. For those familiar with the battle, the names Ponryi and Prokhorovka are well known. 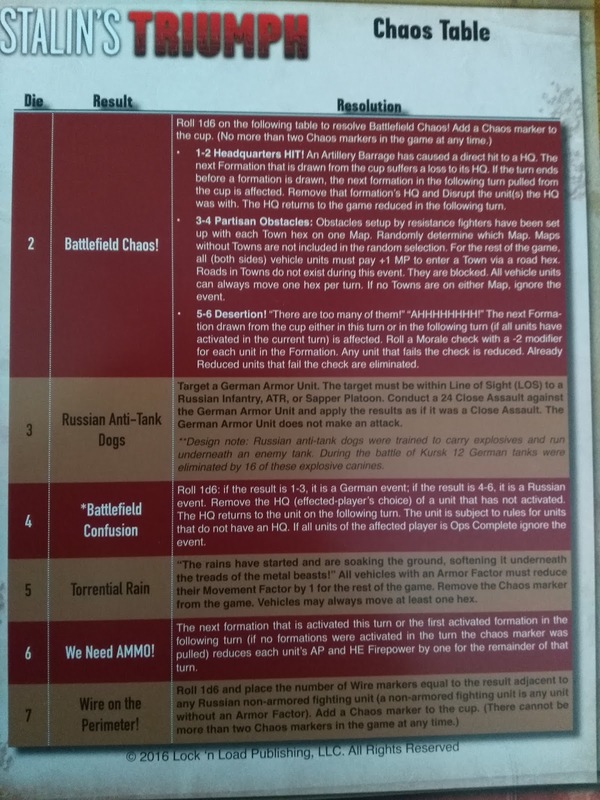 The game has scenarios from both sides of the Kursk cauldron dealing with the attacks of the German Army Group South and Army Group Center. This is good because some games center on the part of the battle that took place in the south and give only lip service to the violent clash in the north. It also gives the player a chance to use Ferdinand tank destroyers (these were named after Dr. Porsche). Besides those you get a plethora of armored vehicles to command. Tigers, Panthers, and Panzer IVs are here along with T-34s, Churchills, and the SU-152 (the beast slayer). The German player can also use FlammPanzer (flamethrower tanks) and Goliath remote controlled demolition vehicles. Air support, which played such a crucial role, is also in the mix. 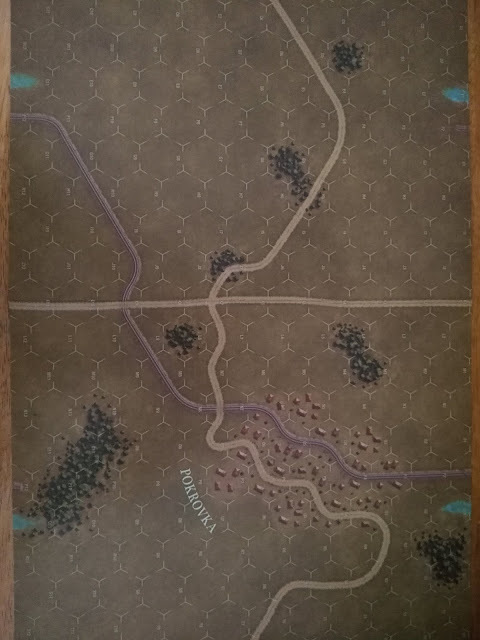 The game includes 'Fate Points' and battlefield chaos to represent the 'friction' of the battlefield. 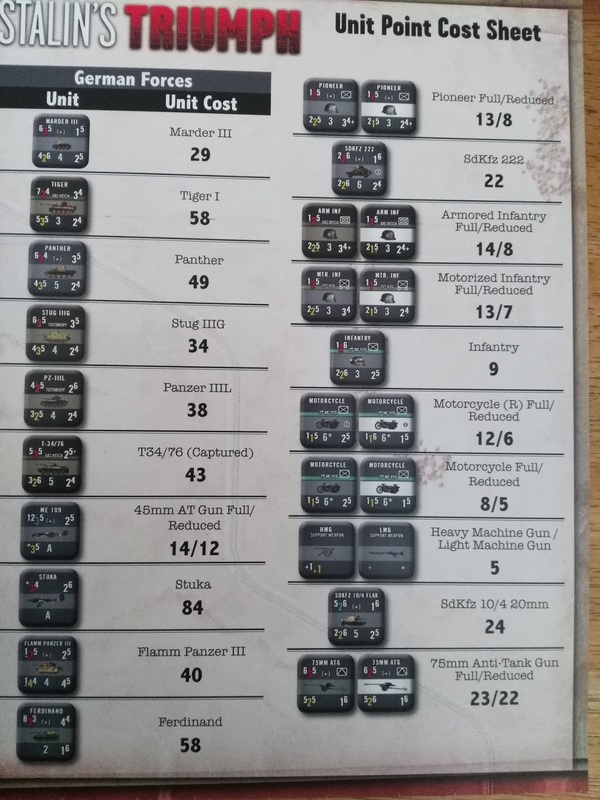 The counters are your typical Lock 'N Load ones, meaning that they are well done and pop from the sprues with minimal effort and cleaning up. They might be a little on the 'busy' side with all of the information included on them. 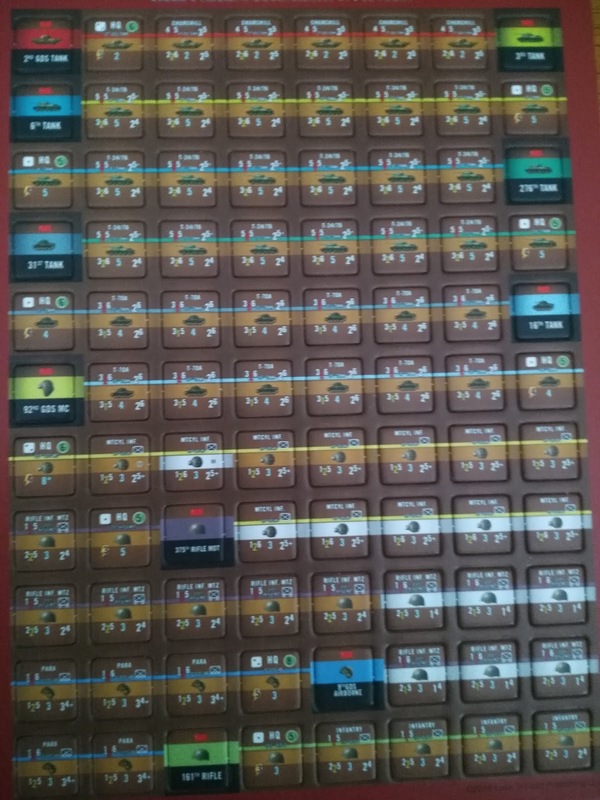 The coloring of the German counters is a bit foreboding and adds a nice touch. The maps are functional with easy to distinguish terrain. They can be mixed and matched to make plenty of different terrain sets which can only add to the life of the game. 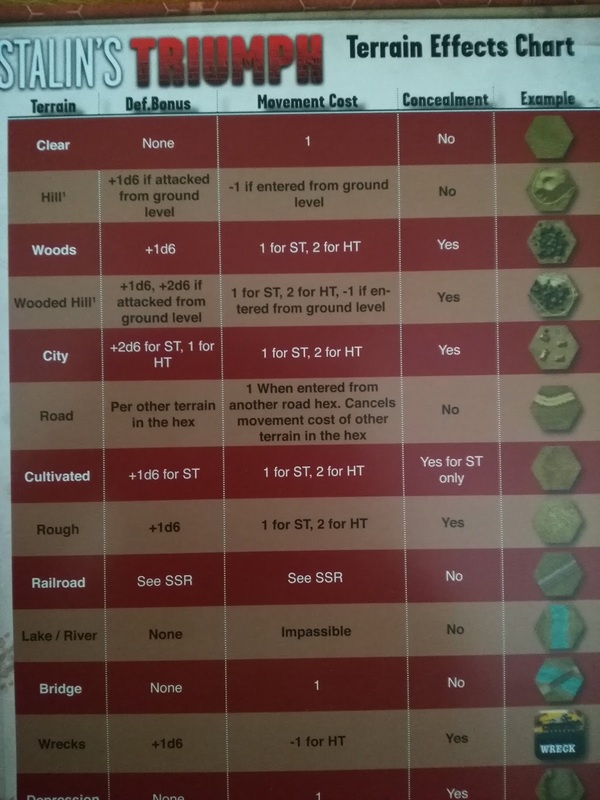 The scale of the game is roughly 150 meters to each hex. 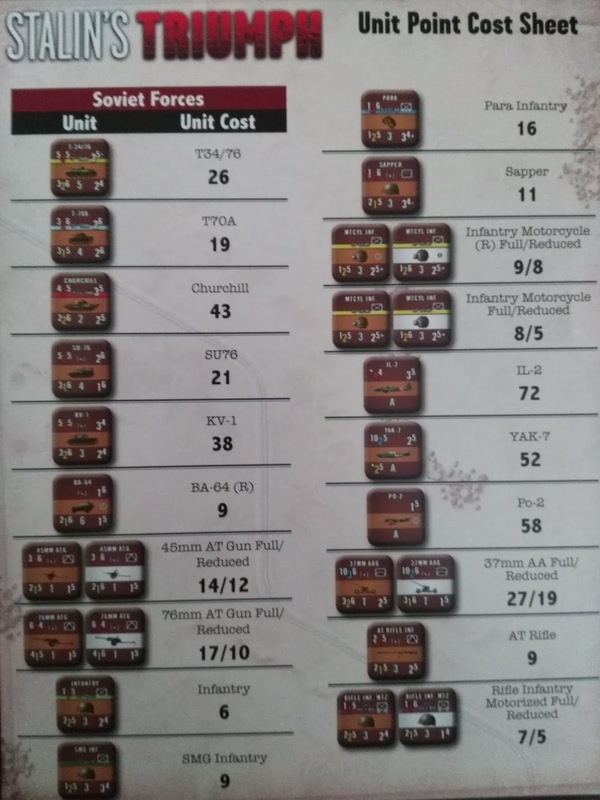 The Platoons are approximately 40-60 men, 3-5 tanks, and 3-5 gun teams. Each turn is meant to be anywhere from 5-15 minutes of real time. Operations phase: Players alternate pulling a marker from an opaque container. These can be Formation, Administration, Chaos, or End Turn markers. 5. Perform Operations: Movement, Assault, etc. Fate points: These are used to be able to reroll die throws or raise or lower die throws etc. One interesting rule addition is the ability of your forces to use 'overwatch'. This is something that is missing in a lot of games, especially as it was and still is a common practice in war. 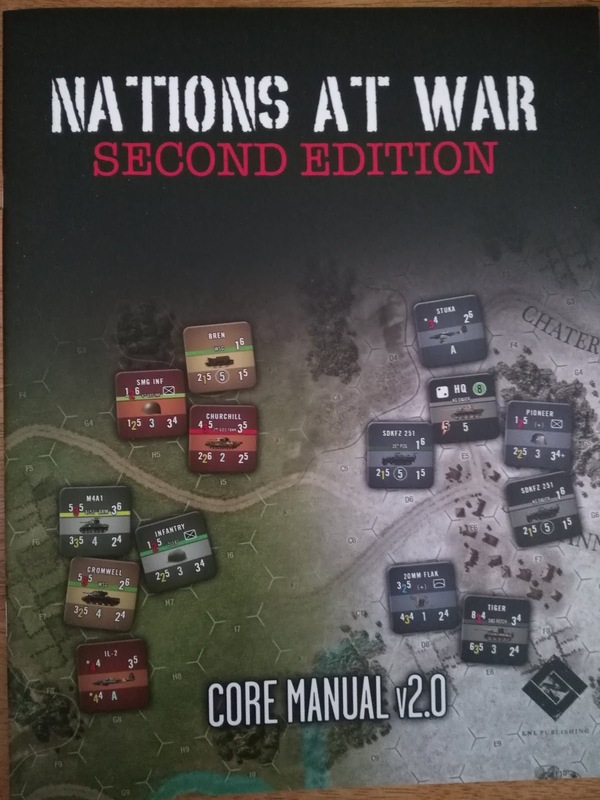 So it comes down to why buy into Lock 'N Load's 'Nations At War' games? One reason is that they are actually listening to players and are constantly updating and revising the rule system (not just on these but all of their games). The physical quality of their components are some of the best on the market. It would have been nice to have mounted maps, but that would have added a large sum to the actual cost and also to the shipping. A mounted map is a nice touch, but what I usually do with games without them is to put a sheet of plexiglass on top to stop any movement. It also acts as the map's protector. Many of us learned this trick when we were Padawans. The rules come in at thirty-five pages, but the printing is extra large and is in color. So it is easy to read and understand with old Grog eyes. I know we are not getting old, just aging like fine whiskey. 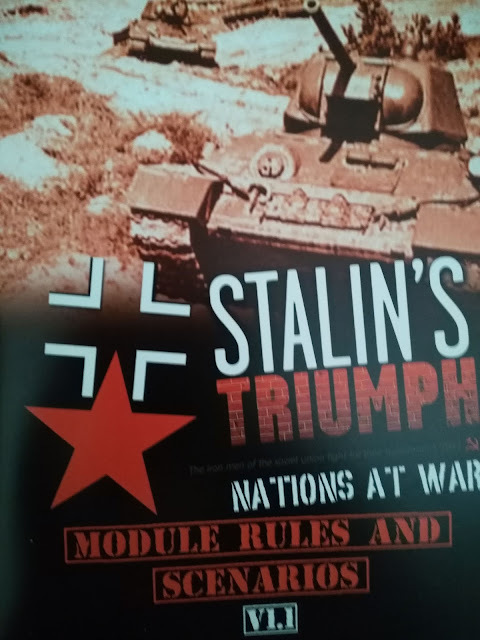 The standard set of rules also makes it so you can pretty much hop from one game in the series to the next without the time consuming learning or teaching. As others have mentioned, the 'chit pull' system for operations is a great way to keep the fog of war going and to help make these games very solitaire friendly. In this day and age a way to play solitaire is almost a mandate in any game. 'On your game table' longevity is enhanced by the fact that the game has rules for anyone to create their own scenarios. The game series has more of a randomness to its 'chit pull' than a lot of other games. In this series it is possible for a turn to end before you can pull a chit to activate some or one of your units. 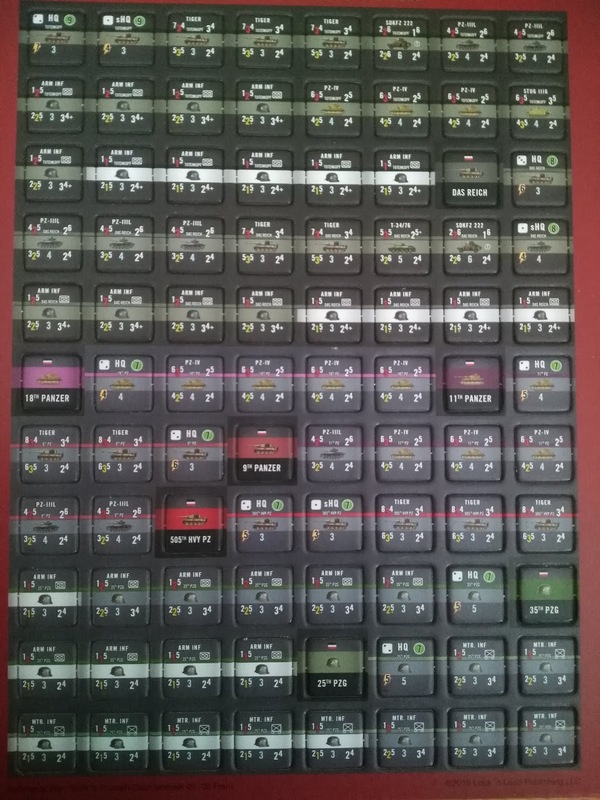 Most games vary the time when you can activate all of your forces on one side, but you can usually activate all of them during a turn. Not so in this game. You may really need that tank platoon to attack that bridge, but instead it just sits there for a turn. It may seem maddening in a game, but just read almost any book about any battles and you will see the same thing in history. You can, if you have the 'Fate Points' to spend, use two of them to be able to put the marker that you just drew back into the cup and choose again. I like the game and look forward to playing others in the series. 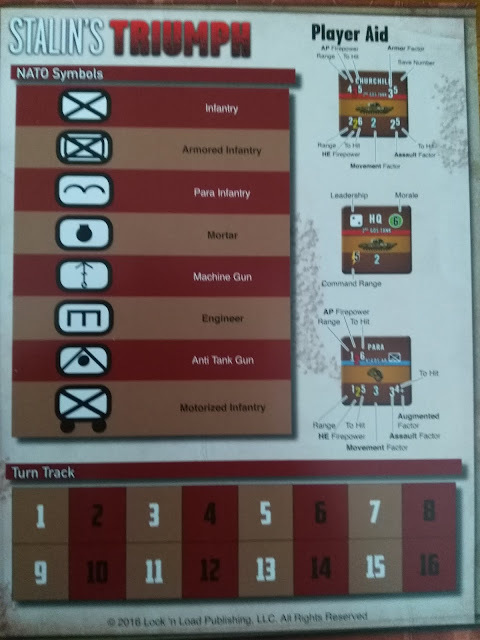 Tactical games are an odd lot. Players either buy into the designer's choices to try and represent space and especially time. I think the game mechanics in this game work and work well. Apparently in the first counters that were made, there was an error on the SS Tiger counters. This was fixed very quickly and the copy of the game I have all is good.